Britannia Master Locksmith Ltd is an established Sussex and Hampshire company specialising in all forms of lock replacement and repairs. We cater to clients ranging from the householder to large businesses and commercial enterprises and our experience in all areas of locks, keys and access security is extensive. Advice is free. Integrity is standard. Customers receive a high standard of workmanship and customer care from Britannia Master Locksmiths ensuring the very best locksmith service. Our Checkatrade feedback with 10 out of 10 assessments, bears out our integrity and reliability. No job is too big or too small with our professionally qualified engineers trained to overcome any challenging tasks set to them. Please call us for our charges. All work carried out comes with a full 12 month guarantee. We are located in Portsmouth and operate in Hampshire, Surrey and Sussex including Fareham, Chichester, Petersfield, Southampton, Winchester and Guildford. Britannia locksmiths provided us with a very professional job that ensured we were able to keep our property safe and secure. At Britannia Locksmiths we repair and replace all forms of door and window locks and security systems. As a Master Locksmith we pride ourselves on our cheap prices and integrity. 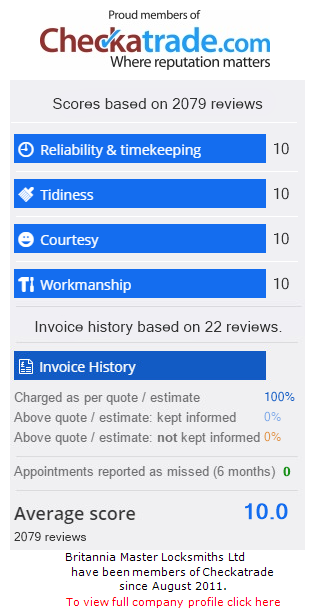 See our Checkatrade feedback for up to date reviews of our capabilities and honesty. Copyright 2018 Britannia Master Locksmith.